We’d love your help. Let us know what’s wrong with this preview of Bad Time To Be In It by David Burnsworth. The past is never past. Sometimes it repeats itself. And sometimes it comes back to pay a visit. Blu Carraway, flush with cash and back in business, never had it so good. Or so he thought.The reality is his love life is in shambles, his business partner is spending too much time with women half his age and not enough time on the job, and someone close goes missing. Blu’s b The past is never past. Sometimes it repeats itself. And sometimes it comes back to pay a visit. Blu Carraway, flush with cash and back in business, never had it so good. Or so he thought.The reality is his love life is in shambles, his business partner is spending too much time with women half his age and not enough time on the job, and someone close goes missing. Blu’s business partner goes off the rails, his friends show their true colors, and he realizes that getting closure sometimes means walking away from everything. With a case from the past gone wrong twice, a loved one in trouble, and an unanswered marriage proposal, it’s a bad time to be in it for Blu Carraway Investigations. To ask other readers questions about Bad Time To Be In It, please sign up. A kidnapping sends Crome over the edge and out of control. Blu wants to help his friend and partner but he sure isn’t making it easy. Blu rallies his friends and sources, Tess and Harmony, who are freelance reporters and even calls Brack Pelton in on the case. When a body is found and another kidnapping occurs they pull out all the stops to save the victims and try to figure out who is behind the crimes before anyone else ends up dead. This series is a spin-off of the author’s Heat series and in this 2nd installment, many characters from that series visit this one. Brack and Blu are similar characters, war vets dealing with the trauma of their service while trying to get on with their lives. Mr. Burnsworth’s characters are so strong and leap off the page. They are a diverse group banded together unconventionally by a series of events. While I have read and enjoyed that series and this one, at times there were just too many characters to keep everyone straight. I did like catching up with Brack and hope he has his own story again soon. He doesn’t seem to enjoy life on the sidelines and it always ready to jump in when Blu calls. The story starts out with a flashback that will then play into the main events of this story. There is another flashback later in the book but the transition was a little clunky and broke the steady climbing trajectory the book was taking. I enjoyed the way previous events impacted the plot, the transitions just needed to be a little smoother. There was plenty of action and again horses have their moment to shine, bringing a huge smile to my face. Blu again went above and beyond. Crome with his him against the world attitude was crazy. Thankfully his friends did everything they could to save him from himself and his enemies. 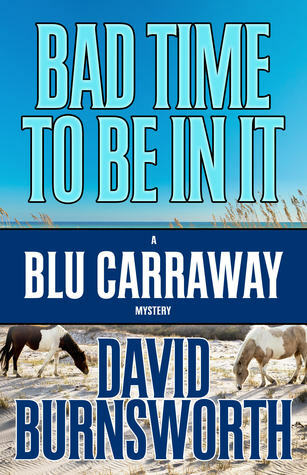 In Bad Time To Be In It, the second book in the Blu Carraway Mystery Series, author David Burnsworth transports the reader back to the sultry lowcountry setting of Charleston, SC for another intriguing Blu Carraway Southern noir/mystery adventure. A year has passed since Blu Carraway and best friend/business partner Mick Crome's last investigative case. But all hell breaks loose when Mick's girlfriend Maureen has been kidnapped! Mick is determined to find Maureen on his own, but Blu and the rest In Bad Time To Be In It, the second book in the Blu Carraway Mystery Series, author David Burnsworth transports the reader back to the sultry lowcountry setting of Charleston, SC for another intriguing Blu Carraway Southern noir/mystery adventure. A year has passed since Blu Carraway and best friend/business partner Mick Crome's last investigative case. But all hell breaks loose when Mick's girlfriend Maureen has been kidnapped! Mick is determined to find Maureen on his own, but Blu and the rest of their team are determined to join in to find Maureen, so they team up and engage in a dangerous game of cat and mouse with a person who is seeking revenge for a past case investigated by Mick and Blu. And if that isn't enough, Harmony, one of their news correspondent pals, goes missing after spending time with the mayor on his boat, and whose dead body washes up on shore. It sure does seem to be a Bad Time To Be In It for Blu Carraway Investigations! Author David Burnsworth weaves a fast-paced and suspenseful tale that follows Blu and Mick's investigative journey as it takes them all over Charleston in search of Maureen and Harmony. The reader is easily drawn into this well-written story with its richly descriptive plot and setting, it is filled with enough action and unsuspecting twists and turns that takes the reader on one hell of a thrilling roller coaster ride. As a fan of Southern fiction, I loved the richly descriptive Charleston setting and the surrounding lowcountry SC areas. I was intrigued by the author's creativity of intertwining his previous Brack Pelton Mystery Series featuring Brack Pelton with the new Blu Carraway Mystery Series featuring low country PI Blu Carraway. The author masterly weaves one hell of a new explosive mystery series, where Blu, Mick, and their team embark on another dangerous investigative adventure! With an intriguing cast of characters; witty dialogue and dramatic interactions; and a richly descriptive setting that makes a person want to visit the picturesque city of Charleston, its historic landmarks, and the surrounding lowcountry areas; Bad Time To Be In It is an intriguing tale that has the true essence of a classic Southern noir mystery, but beware it does have a cliffhanger ending that will surely leave the reader wanting more! Disclaimer: I received a copy of the book from the author/publisher via NetGalley in exchange for my honest review and participation in a virtual book tour event hosted by Partners In Crime Virtual Book Tours. I like Blu. He is not your average private investigation guy. He is unconventional and so are his methods of finding the truth. He is unflinchingly loyal to his friends and serious trouble to his enemies. His partner in business, Crome, is larger than life. With his girlfriend kidnapped, Crome goes off the rails, Blu going after him. Those two make for an exciting plot. Burnsworth includes a number of secondary characters. At times I was a little confused as to who they were and how they fit in. I like Blu. He is not your average private investigation guy. He is unconventional and so are his methods of finding the truth. He is unflinchingly loyal to his friends and serious trouble to his enemies. His partner in business, Crome, is larger than life. With his girlfriend kidnapped, Crome goes off the rails, Blu going after him. Those two make for an exciting plot. Burnsworth includes a number of secondary characters. At times I was a little confused as to who they were and how they fit in. I like the setting for the novel, the seedier side of the Charleston area. It is a part of America I rarely get to read about. There was an interesting black flash in the midst of the novel. I felt it broke the narrative a bit but it was good for giving some history between Blu and Crome and how they work together. While it was ultimately a part of the current story I would have preferred it to have been a prologue. I recommend this novel and the Blu Carrawy series to readers who enjoy a flawed hero slogging his way through the darker places in the Lowcountry of South Carolina. There is plenty of action, keeping the narrative moving along. In the second installment of the Blu Carraway mystery series, Blu Carraway's long-time friend and partner Mick Crome practically loses his mind when his girlfriend, Maureen, is kidnapped. Who can blame him? But when those who care about him try to help, he refuses. In true Carraway fashion, Blu, along with a pair of sassy journalists/reporters (Harmony & Tess) and Brack Pelton (Pirate's Cove), jump in anyway. I got a little lost with the assortment of characters but I did enjoy how their per In the second installment of the Blu Carraway mystery series, Blu Carraway's long-time friend and partner Mick Crome practically loses his mind when his girlfriend, Maureen, is kidnapped. Who can blame him? But when those who care about him try to help, he refuses. In true Carraway fashion, Blu, along with a pair of sassy journalists/reporters (Harmony & Tess) and Brack Pelton (Pirate's Cove), jump in anyway. I got a little lost with the assortment of characters but I did enjoy how their personalities mesh. The flashback was enough to give us some backstory without droning on forever with too much detail. I love a suspenseful mystery -- the action makes your throat tighten and breathless at times. The power behind a strong friendship is what really made this book pull everything together. They all worked together and brought the events at hand back down to earth, working together to solve mysteries of the past and present. PI Blu Carraway's partner Mick Crome goes off the rails when his girlfriend Maureen is kidnapped. Crome refuses any help but his friends including Blu, feisty freelance journalists Tess and Harmony, and the Pirate's Cove Brack Pelton get involved. Through flashbacks, the motive for Maureen's kidnapping is eventually linked to a case from 2000 involving economic developer Ron Jansen, cruise ships and ecological group interests. I enjoyed the first Blu Carraway mystery but this second book did not PI Blu Carraway's partner Mick Crome goes off the rails when his girlfriend Maureen is kidnapped. Crome refuses any help but his friends including Blu, feisty freelance journalists Tess and Harmony, and the Pirate's Cove Brack Pelton get involved. Through flashbacks, the motive for Maureen's kidnapping is eventually linked to a case from 2000 involving economic developer Ron Jansen, cruise ships and ecological group interests. I enjoyed the first Blu Carraway mystery but this second book did not work for me. The six days in the book plodded on and I lost interest. The motive behind the kidnapper's revenge against Blu and Crome was also weak. Thank you Netgalley for this book, but unfortunately, I could not finish it. After 45 pages pages I gave up. To be honest, the book is reading like a telephone directory. Names, names, names. Every character in this book knows lots of people, and they know lots of people and all those people have names (of course) and a backgroud. Every time someone in this book needs something, it may be information or a cup of coffee or whatever, a new person pops up to deliver. I've been reading about people Thank you Netgalley for this book, but unfortunately, I could not finish it. After 45 pages pages I gave up. To be honest, the book is reading like a telephone directory. Names, names, names. Every character in this book knows lots of people, and they know lots of people and all those people have names (of course) and a backgroud. Every time someone in this book needs something, it may be information or a cup of coffee or whatever, a new person pops up to deliver. Boy, was it ever! A bad time to be in it, that is. Blu’s life is a mess. An interesting mess, but still a mess. All of his life. His love life, his business and relationships with his friends. Some of his problems include murder, kidnapping, an elusive girlfriend and two news reporters. This was an enjoyable book that kept me guessing. I really like Blu Carraway. His house, too. Thank you, Mr Burnsworth. When will I be able to see Blu again? I have mixed feelings on this book. I agree with another reviewer that the flashback would have done better as a prologue rather than put in the middle. I'm always a little discouraged by grammatical errors but when a character completely changes his name, you start to lose me. That being said, I love these characters. I want to read the next book because I want to know where life takes them. They are the reason I give it 4 stars. When one of their own is kidnapped Blu and Crome must solve a mystery to figure out who the kidnapper is. But with no ransom note, they have to decide who the kidnapper is targeting. Lots of testosterone but not lacking in the lady department. A fast-paced mystery with plenty of firepower. An action mystery. Nice to read about a couple of men as the protagonists, but still not be offended by language and intimate details. Love the horses and dogs. Interesting relationship issues. Appreciated getting into the story before getting the back story. I am enjoying this series and look forward to the next one. The publisher provided a copy via NetGalley. In this novel about two missing women, the only thing truly missing was an interesting plot. Hopefully the author hasn't quit his day job. Blu, of Blu Carraway Investigations. and his partner Mick Crome are back! And that means only one thing, a lot of action! This is the 2nd book in this series, see my reviews for BLU HEAT, a prequel and IN IT FOR THE MONEY. Blu and Mick are hired by Mr.Jansen, as he feels someone is following him. At the same time, Mick’s girlfriend goes missing. The days are going by and they are no closer to following Maureen. So their friends join them in the search. A journalist that works with them, Harmony, jo Blu, of Blu Carraway Investigations. and his partner Mick Crome are back! And that means only one thing, a lot of action! So their friends join them in the search. A journalist that works with them, Harmony, joins the Mayor on his boat and word comes that the Mayor’s body has washed up but no sign of Harmony. Are these disappearances and Jansen connected in some way? Where are the women? The group ramps up in finding who has kidnapped. After reading the previous books in this series, I knew that would be non stop action. And because of that, I was turning the pages as fast as I could because I knew there would be an explosive ending if they found Maureen and Harmony. This book did not disappoint. Another great read by David Burnsworth! And with a cliff hanger at the end, I’m so excited now knowing that this series will be continued. Now I have to try to wait patiently for the next book!